Pasta, the flavourful dish from Italy has somehow become so popular in India, that it features in most dinner parties, kiddie birthday parties, buffets and multi cuisine restaurants in cities. It’s super easy to make, tastes wonderful and can be adapted in so many ways – and has – in so many countries to suit their own ingredient baskets that the Italians must be crying about how its been butchered by one and all. Much like Indians do when we eat our cuisine abroad! This dish is surprisingly one of my kids’ favourite in the pasta basket. 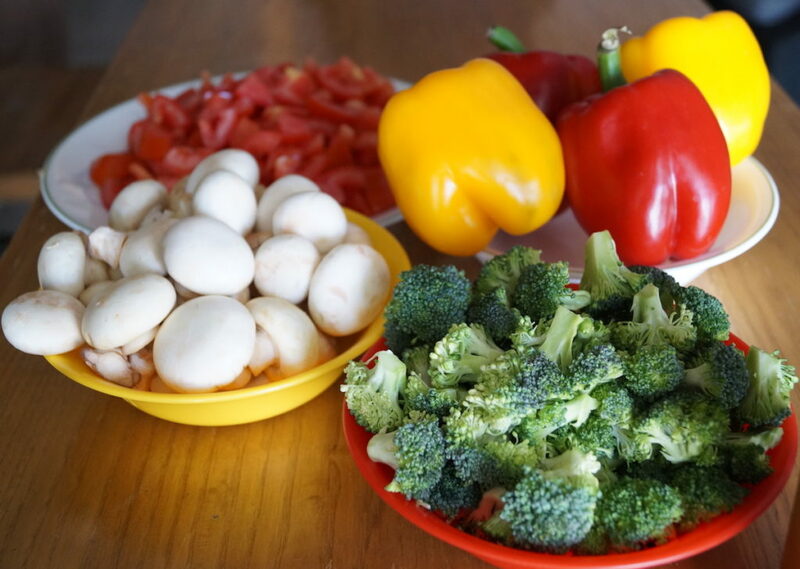 It’s the only dish where I can get my son – whose dining table drama includes whining and gagging whenever he gets veggies he doesn’t like – to eat three of his most disliked vegetables – bell peppers, broccoli and mushrooms – and actually enjoy most of it. The sauce is so yummy that it makes everything taste good. As I’m a bit of a strict mother where food and nutrition is concerned, the kids have to eat healthy veggies they don’t like sometimes. No negotiations, but I try to make them more bearable if i’m giving it to them. From not being able to even eat anything touched by green capsicum when I was a kid to actually being able to eat one or two thin slices in a sandwich or pizza has been a huge progress for me. I also don’t mind something flavoured with it, but the thought of having soggy green capsicum is still too much for me so I’ve left it out entirely here. Guess you see where the brat gets his distaste for the veg from huh. Red and yellow peppers on the other hand, I love, and there’s the added benefit of eating coloured vegetables that are rich in antioxidants. They have a mellower and less pungent flavour which makes them excellent to use in sauces or salads or even just roasted with garlic and olive oil with their skins removed. You can remove the skin here but I wouldn’t bother with the extra work which would set you back 20 minutes and wouldn’t make much of a difference. You can add anything to the pasta. Vegetables of your choice or chicken, or sausages, or whatever really. This just happens to be my favourite combination and I feel I’m getting a good dose of healthy with the broccoli added to it. The combination of the two coloured bell peppers, tomatoes, cream and cheese provides a delightful mellow flavourful sauce. I’ve added no spice to it as it truly doesn’t need anything else. I used the tricolour fusilli here. 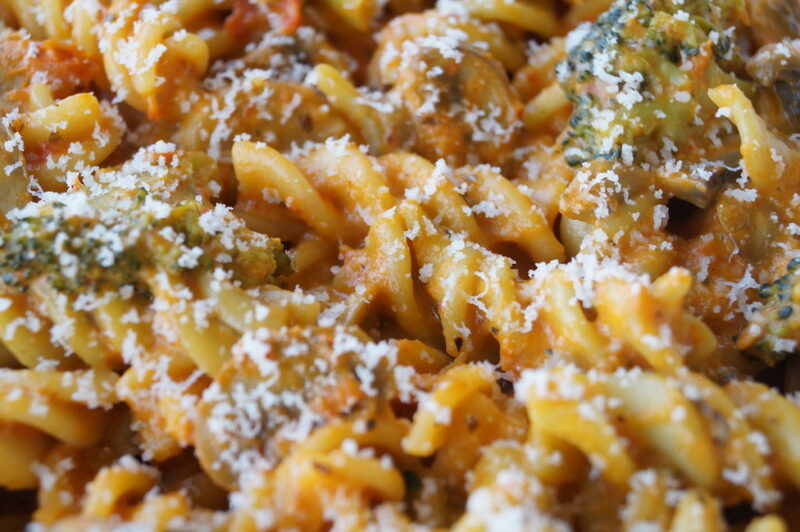 You can use plain, or penne or macaroni or any other pasta actually. Here goes. Boil the fusilli with a tablespoon of salt for the required time mentioned on the packet till it’s at the al dente stage (not fully cooked with a bit of a bite to it). Immediately remove from water. You can pour some cold water over it at this stage to stop it from cooking further. 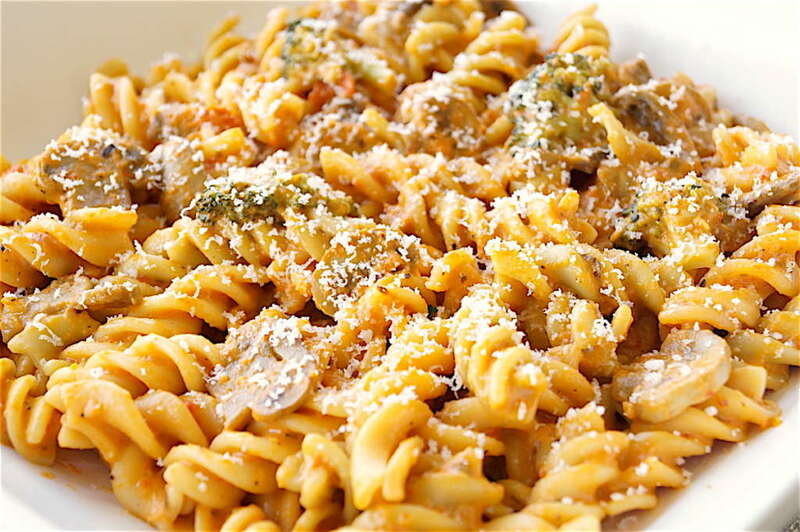 Add a tablespoon of oil to the pasta and toss so that the fusilli don’t stick to each other and set aside. Keep a mug of the pasta water for use later. Wash the mushrooms, broccoli, bell peppers and tomatoes well. Slice the mushrooms (one into four slices, larger ones more) and cut the head of broccoli into small florets. Cut the bell peppers open, remove the seeds and the white flesh and chop into cubes. Do the same with the tomatoes, removing the seeds and cutting into cubes. 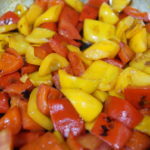 In a large pan, saute the chopped red and yellow bell peppers in three tablespoons of oil on medium heat till softened a bit, about 10 minutes. Add the tomatoes and saute till they’ve softened too, about 10 minutes more. Turn off the heat and allow it to cool. Make sure the heat is on medium, not high as you don’t want the bottom of the pan to go black and char your peppers. If that happens, immediately transfer to another pan and try to remove as much of the charred skin as possible. a little bit of char is fine. While the peppers and tomatoes are cooling, saute the mushrooms in 2 tablespoons of olive oil or vegetable oil if you don’t have olive oil. Set aside. Blanch the broccoli in boiling water for a minute then remove from water and set aside. When the peppers and tomatoes have cooled, put them in a mixie or blender with two tablespoons of garlic paste and whack till completely smooth. Pour the sauce into a sauce pan, add the salt, basil, oregano and a cup of water and simmer on medium heat for three minutes. Then add the cream, simmer for a minute and add the cheese and simmer till the cheese melts into the sauce. 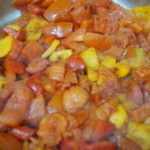 If the sauce gets too thick add a bit more water and simmer down till you get the right consistency. Taste to check seasoning. Add more salt if required. Add the broccoli and mushrooms to the sauce and then add the pasta. Mix well and serve immediately with parmesan cheese grated over the top. If not serving immediately, the sauce will thicken and become dry. This is where you add a bit of the reserved pasta water to the mix and toss over medium heat till it becomes silky and thickens to the right consistency. Caution: Don’t do this too many times or for too long as the fusilli will soften too much and become soggy. 1. Saute the bell peppers. 2. Add tomatoes and saute till it reaches this stage. Then cool and whack in a mixie.